Text Font. The name and size of the default font for note text ($Text). This sets the default for $TextFont and $TextFontSize. Previously these were set separately. Text size is now set directly in Points. Default is MercurySSm-Book at 16pt. Previously it has been variously: HoeflerText-Regular, Cochin, Lucida Grande, and originally Geneva. 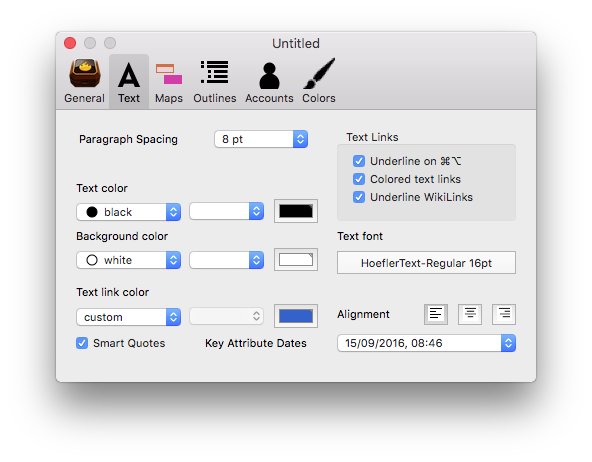 As note default text size is also set via the OS Fonts dialog, a wider range of default sizes is possible than in early versions of Tinderbox. When the default text font is changed, Tinderbox scans the text of every note in the document and changes each usage of the former text font to adopt the new font family while retaining the current size.